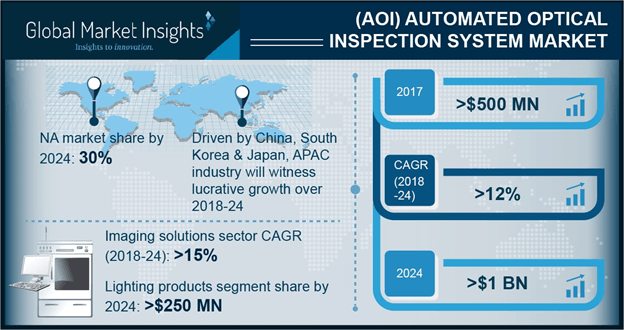 Automated Optical Inspection (AOI) Systems Market size is projected to exceed USD 1 billion by 2024; according to a new research report by Global Market Insights, Inc. The rising government concerns and regulations to ensure the quality of electronic components and systems create several AOI systems market growth opportunities. Safe and secure electronic assemblies require high-quality and miniature printed circuit boards that are developed by inspection capabilities. The increasing number of problems, such as device break-ups and slow speed, due to faulty PCB units creates the need for their inspection and testing. In such cases, these systems offer high speed and accuracy to detect the assembly and manufacturing faults. Furthermore, the penetration of electronic assemblies in the automotive systems in EVs and HEVs drives the automated optical inspection (AOI) systems market demand. These systems also detect the electronic components used in the production and assembly lines of the automotive systems and parts. A major factor hindering the AOI systems market progress is the emergence of ball grid array in PCB manufacturing activities. The demand for this technology is attributed to the provision of inspection and packaging operations simultaneously, saving operational and manufacturing costs. The rework inspection solutions in automated optical inspection systems market will grow at CAGR of nearly 12% due to high demand from PCB manufacturing companies owing to the benefits offered in board separation techniques. The products mainly include rework conveyors that offer the PCB buffering possibilities and detect the failed PCBs in production lines. These systems comprise rework capabilities that are used for the inspection of microelectronics, which are implemented in the automotive electronic systems such as lighting and safety systems. The rework assemblies are associated with the offline rework stations in the machines that review faults at the end of the inspection process. For instance, Inteon offers an AOI rework conveyor that facilitates good/bad PCB separation value-added features such as Omron PLC control system, three-belt segments, and SMEMA compliance. 3D automated AOI systems market will grow at CAGR of around 14% attributed to the benefits such as improved image dimensions and inline detection capabilities. The implementation of these systems offers improved PCB quality over the 2D systems during the manufacturing process. It supports the inspection of miniaturized and complex components, which are deployed in the consumer electronics products. These systems offer the early detection of PCB defects in the assembly process that further assures the production quality. Several inspection functions combined in a single machine reduces the company’s manufacturing costs and eliminates human intervention. For instance, Mirtec offers its 3D AOI its MV9 Series with five cameras in the 2D/3D options. Inline systems are gaining popularity in the AOI market due to the benefits, such as high flexibility, to detect PCBs during the entire production process and faster detection as compared to the offline systems. Reflow soldering valued at nearly USD 110 million in 2017 in the automated optical inspection (AOI) system market is witnessing high demand from the SMT manufacturers, which is attributed to the detection of pre-reflow and post-reflow techniques. This includes the inspection of solder paste and joints in the PCBs and ensures fault detection at every stage. The systems ensure appropriate assembly of SMT with the help of AOI-based reflow soldering. Automotive components require miniaturized and high-quality PCBs with defect-free assemblies. As a result, the reflow soldering applications deploy these systems at pre-reflow and post-reflow stages to ensure high security of the PCB production lines thereby driving AOI system market. The North American automated optical inspection systems market is rapidly growing to reach a revenue share of around 30% by 2024, due to the high demand for developed automotive products. The U.S. AOI systems market is witnessing high penetration of several PCB and consumer electronics manufacturers. The increasing concerns for developing high quality and safe electronic components further add to the usage of the inspection machines. The demand is attributed to features of advanced systems such as three-dimensional images, quick fault detection, and analysis of the PCB production lines. Moreover, the growing demand for technically-advanced products in the U.S. due to the presence of awareness among the population accounts for the (AOI) automated optical inspection system market growth. The key companies operational in the AOI systems market comprise Nordson Corporation, Cyberoptics Corporation, Orbotech, Kurtz Ersa, Koh Young Technology, Viscom AG, Mirtec, Saki Corporation, Omron Corporation, Machine Vision Products, Inc., ASC International, and MEK Marantz Electronics Ltd. AOI system market players focus on developing long-term relationships with the automotive and electronics OEMs. They also offer several application-specific machines to gain competitive advantages.